We are less than a month away from WWE’s biggest PPV of the year: WrestleMania 35. The card for the show is shaping up to be a really solid one. And in the center of it all isn’t a match for the Universal Championship or a match we assume to be The Undertaker’s retirement match. The highlight in the build-up to WrestleMania 35 has been: Ronda Rousey (c) vs. Becky Lynch vs. Charlotte Flair for the RAW’s Women’s Championship. We have already seen WWE do everything possible to make Becky Lynch, Charlotte and Rousey’s Road to WrestleMania an unforgettable ride. In fact, there have been stories about WWE writing and rewriting this feud every week. Here, we present you with 5 more things WWE should in this possible ‘Main-Event’ of WrestleMania 35. This would be great to watch, If nothing else. If you’ve paid attention to WWE Programming or have seen/read a single report about the RAW Women’s Championship feud, you’d already know that Charlotte Flair is the clear third wheel in this main-event feud. It’s almost apparent that Charlotte Flair is there to tap-out on April 7, whether it’s to the Disarm-her or the Arm-bar. While Rousey and Lynch have been wild and hungry, Charlotte has played the tamed tigress. WWE has almost overworked this story, yet there hasn’t been much for Charlotte, who is definitely one of WWE’s best women’s performers ever. Now, that should change on the Road to WrestleMania 35, irrespective of the end result. Fans need to believe that The Queen can realistically win the Championship at WrestleMania. And, what better way than to let her dismantle the ‘Baddest Woman on the Planet.’ Not only will a crazy beat-down establish Charlotte as a real threat to the title, but also give this story another layer. 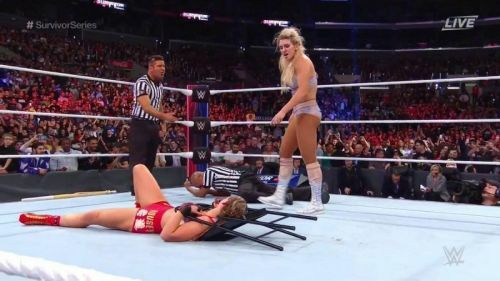 The way Charlotte and Becky Lynch’s match ended at Fastlane, and all the things Rousey has been saying off-late, even a heel Charlotte has enough reasons to make a statement.